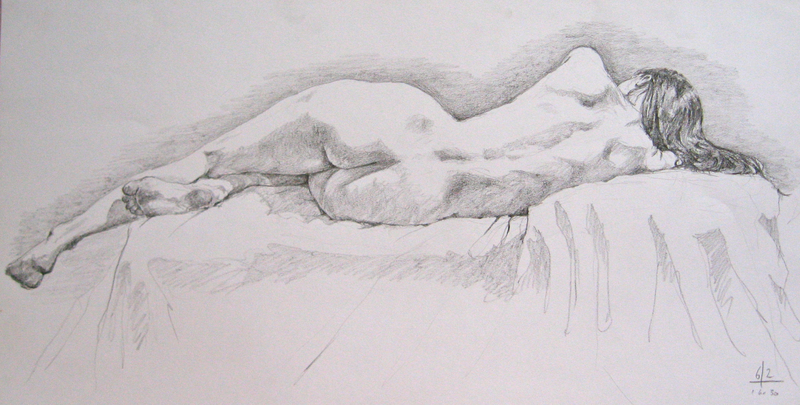 Life drawing classes open at 9:30 a.m. every Tuesday and Friday morning at the Provincetown Art Association throughout the year. The sessions feature live models and easels are provided. The sessions last for two hours. The cost is quite low at $10.00 per person per session or $45.00 for 5 sessions. No preregistration is required and walk-ins are welcome. The sessions are staged upstairs at the Museum School. Artists are asked to enter the Bangs Street entrance. There is no parking on site and you should know that there is no parking on Tuesdays in front of the museum from May to October because of street sweeping. There is a schedule of models posted and the sesssions feature male and female models on alternating weeks. The Tuesday sessions feature long poses and the Friday sessions feature short poses. Get more information about the sessions on the PAAM website. The figure drawing above is by Jon Nagl. It is posted here under a Creative Commons license. You can see the original beautiful figure drawing here. We try to be as accurate as possible with our listings. We recommend that you check the event's website, organizer or the event venue before you plan your trip. Sometimes the dates or the times are incorrect and at other times, the event might be canceled because of bad weather or other circumstances. Please let us know if you find a mistake in our Massachusetts events listings. Contact us and let us know how we're doing. Bellingham will celebrate Independence Day with a fireworks display on July 4. The event will be held at Bellingham High School on Blackstone Street at the athletic fields. The fireworks are scheduled to start at about 9:30 pm. The rain date for the event is on July 5. For more information, see the town site.